A site plan for Magnolia Marketplace, as submitted to the City Planning Commission. If you thought the new Taco Bell on South Claiborne was exciting news for Uptown New Orleans, just wait till you meet its new neighbors. If Tuesday afternoon’s approval by the City Planning Commission is any indication, a major new shopping center called Magnolia Marketplace is soon headed for the large open area just off South Claiborne Avenue adjacent to the Harmony Oaks development. At two stories and 156,000 square feet, the project is actually larger than the Costco store being developed on Carrollton Avenue, though plans submitted to the City Planning Commission show it divided among six tenants. 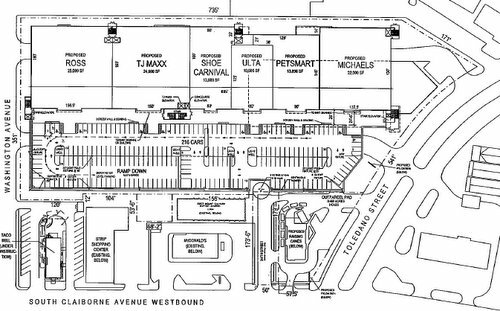 The businesses listed on the plans are Ross, TJ Maxx, Shoe Carnival, Ulta, Pet Smart and Michael’s, although the status of negotiations with each of those tenants was not detailed. The main retail building stretches from Toledano to Washington, in the center of the block between Clara and South Claiborne, with a two level parking garage in front of it. The project will also feature a Raising Cane’s fried-chicken joint in a separate building at the corner of Toledano and Claiborne, which would join McDonald’s and the forthcoming Taco Bell in the block. Although the area is zoned residential because of its past inclusion in the former C.J. Peete housing development, the new Harmony Oaks development has a smaller footprint, and this front portion was generally envisioned for commercial development, officials said. With a 73-page report compiled by the City Planning Commission staff, the developers spent little time during Tuesday afternoon’s hearing discussing their retail offerings. Instead, they took issue with some of the changes recommended by the city planning staff and countered strong opposition from leaders of a church that will be completely surrounded by the development. Specifically, developers with JCH Development, Stirling Properties and Mathes Brierre architects said they needed setbacks from South Claiborne and signage sized similarly to the McDonald’s. City staff members replied that the McDonald’s was built before current zoning rules intended to encourage pedestrian activity, and that the traffic and parking combination requested by the developers is a suburban style that would make walking to the development unsafe. The City Planning staff is also recommending that the project dramatically reduce its parking, from 484 spaces planned to 313. The area freed up could be used for landscaping and stormwater retention, the staff said, noting in response to one Planning Commissioner’s question that multi-level parking is uncommon for retail developments in the city. Architect Ed Mathes urged the commission to consider the needs of the retail tenants, arguing that the only way to attract retail back into the city is to allow the signage, parking and other amenities the retailers need. “We are respectful to pedestrian traffic, but we have to be respectful to people who aren’t in walking distance,” said developer Lewis Stirling. The project drew sharp opposition from the leaders of the First Mount Cavalry Baptist Church. Pastor Ulysses Landry took particular issue with the idea of closing the small section of Sixth Street that comes off South Claiborne, an idea the developers said they had originally considered but abandoned, though they had not shared that with the church. “I don’t think anyone understands what’s going to happen in front of the church,” agreed church member R.D. Morris. Tara Hernandez of JCH Development replied that the church members had stopped meeting with the developers, and said the developers had been willing to create access to the church through the shopping center parking lot and to allow the congregation to park in their garage. Planning staffers said they were aware that the development no longer proposes to close that portion of Sixth Street. Planning Commission George Amedee, however, said he was troubled by the breakdown in communication, and recommended postponing a vote on the issue until January to give the church, the developers and the city staff time to meet all together. “Both sides could benefit from further discussion,” Amedee said. Amedee’s motion got only four votes, one shy of passing, however. A second vote, to recommend in favor of the project as modified by the planning staff’s recommendations, then passed 5-1, with Amedee the dissenting vote. The rezoning request next proceeds to the full City Council for final approval. An aerial view of the project as included in the City Planning Commission report. Please email your city council rep if you support this. All you have to do is Google ” New Orleans city council map ” to get their email. It’s time for the few to stop getting their way in this city. Not all of us have the money or time to participate in neighborhood associations which of course will oppose this. We need to email the council in support of construction. They are gonna put Ulta in the ghetto? That’s pretty funny! OK, wow, for 96 years!! Well, let’s just look at the last 30 years on helping the area. And what do they have to show for all their community service for the last 30 years of their 96 in existence? One of the worst areas in the city that contribute to a murder rate that is 10 times the national area. Just last year, after the new housing was finished, gun shots from the street aimed straight at an outward facing apartment. The young black men in that area are the same ones robbing stores and people on Freret and Magazine Streets as well as the university area of Tulane U. and Loyola U. Whatever that church is doing, it’s not having any noticeable effect whatsoever for the last 40 years or more, at least not in that area. Furthermore, if you listen to the video around the 30 min mark, all these national retailers might have some RULES as opposed to the URBAN and HIP HOP clothing stores across the street as well the mini van that sells stuff on the left hand side of that shopping mall. Even, If you are BLACK and not a drug user or dealer, you would be crazy to shop at that URBAN strip mall across the street, and that was just built only a year or so ago!! What’s your problem with the dude with the mini-van? Great prices, friendly service! Buy local – buy Mini-Van Dude! I don’t have the time to read, empathize, and try to understand all that is at play on this. So I hope compromises, revenues, and jobs can be made, and there are no TIFF like tax creds or other unfair advantages given that hurt small businesses. This is a really good thing for this area with higher end retailers than one might expect looking at the surrounding land uses. Keeping shoplifters out may be a hassle but the added jobs and tax revenue generated here is a huge plus for this neighborhood. Pros outweigh the cons for sure. I’ll be disappointed if they drop the ball on this. I have no opinion on whether or not the proposed development should be allowed to proceed. But I do say that it’s unfair to criticize the Church because problems exist in its surrounding area. Also, look at the shopping malls that are going under, even in affluent areas. Is this the best time to be opening one in a poor neighborhood?